PORT CREDIT SALMON AND TROUT ASSOCIATION: Stay tuned to hear about future projects: fish derbies and proposed Fisheries Interpretive Centre (see below). ► Click logo image for PCSTA Facebook Page. ► See also the PCSTA website. PORT CREDIT'S ANNUAL PEN PROJECT: Saturday, April 6, 2013 @ 11:30 a.m. 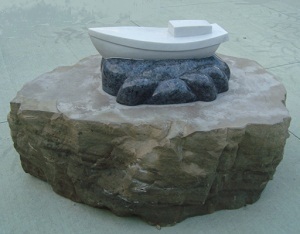 Attend at the docks to see the salmon fry loaded into their pen at the PORT CREDIT VILLAGE MARINA (map). Sponsored by the Port Credit Salmon and Trout Association. A LOCAL RITE OF SPRING! The PCSTA plans to help raise 10,000 baby Chinook Salmon until they are strong enough to fend for themselves out in the big lake. Their home will be a specially designed pen, or floating cage, that is about the size of a small car. Fed a steady diet, they will grow quickly. These salmon are hatched from eggs collected from the Credit River last Fall and raised in the Ringwood fish hatchery. They will be about 4-6 inches long by the time they are released into the Lake a few weeks later. Each year up to half a million Chinook salmon are released on the Ontario side of the Lake. All of them began their lives as eggs collected from the Credit River salmon. ► Click for PHOTO ALBUM of the 2011 salmon pen community event. ► Mississauga News article (March 31, 2012): Salmon growing at Credit Village Marina. ► Read about converting the Saddington Park pumping station to a local fish-raising and interpretive centre. FISHERIES INTERPRETIVE CENTRE - PORT CREDIT: Progress is being made on the local initiative for adaptive and functional reuse of the heritage pumping station buildings at J.C. Saddington Park, spearheaded by the recently formed Port Credit Salmon and Trout Association. The proposal includes 4-6 fish-raising tanks, an aquarium of common sport fish and an interpretive centre in the cistern that will tie Port Credit to its fishing roots and be a resource for local school groups. The Ministry of Natural Resources and Credit Valley Conservation are strongly in support, and there is tremendous community enthusiasm for this year-round operation including groups such as TOPCA and the Port Credit BIA. Bob Cutmore, a PCSTA Director, is a local advocate and liaison for the project. The Waterfront Parks Strategy: J.C. Saddington Park (15p PDF) provides discussion about the desirability of adaptively re-using these pumping buildings which have sat empty for 40 years. The necessary pumps and pipes are already in place! With the City's permission, the buildings were physically evaluated on December 21, 2011 by engineering consultants from AECOM as to potential design and remediation considerations in support of a formal PCSTA proposal to the City as early as April 2012. Richard Collins, president of the Mississauga South Historical Society is concurrently preparing a Heritage Impact Statement which could go to the Heritage Advisory Committee as early as March 2012. 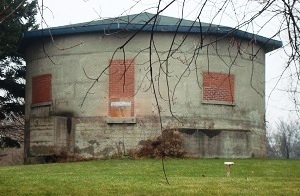 Above: Water cistern (c1920) located at Saddington Park, from outside and inside. 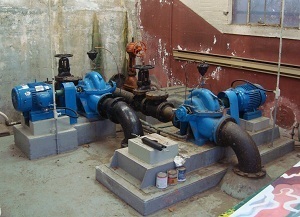 Left: Equipment inside the pumping building. 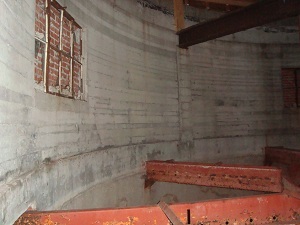 ► Click images to view PHOTO ALBUM (38p PDF) of cistern tour: December 21, 2011. Albums of the two pumping station buildings will also be posted shortly. ► YOU CAN HELP! Citizens can help move this project along by becoming members of the Port Credit Salmon and Trout Association (see above).